Orthodontic Extras | Lindner Dental Associates, P.C. Before and after pictures of some of our patients. Patient 1: This patient presented with an open bite due to a longstanding thumb habit. She was treated with braces for about 2 years and had excellent cooperation with her elastics. Patient 2: This patient presented with severe crowding. She was treated with extractions of 4 side teeth and has an excellent result and a beautiful smile. Patient 3: This patient presented with crowding, a deep overbite, and a shifted midline of the top and bottom teeth. He achieved an excellent result with braces, elastics and springs to help correct his bite. Imagine earning points for being a great patient and having a great smile! 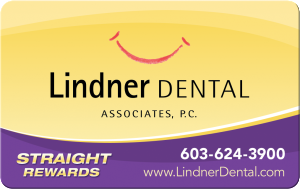 With Lindner Dental, you get a membership club of lucky users who earn points for doing all kinds of awesome things. And the best part is that you get to use your points to play games, order gift cards, and more! Loose Bracket: If the bracket is still attached to the wire, leave it in place. If uncomfortable, cover with wax. If it comes out completely, bring it with you to the next appointment. Call for an appointment. Do not connect elastics to a loose bracket. Loose Band: If the band is still attached to the wire, leave it in place. If uncomfortable, cover with wax. If it comes out completely, bring it with you to the next appointment. Call for an appointment. Do not connect headgear or elastics to a loose band. Loose Elastic Tie or Wire: Please call to ask if an appointment is necessary. Notify an assistant at you next appointment. Soreness from Braces: Rinse your mouth with warm salt water. If necessary, take the pain reliever that you would use for a headache or similar discomfort. Wire Out of Tube: Try to place the wire back into the tube with tweezers. Place wax if uncomfortable. Call for an appointment. Shifted Archwire: Try to slide the wire back around to the other side. If unsuccessful, place wax and call for an appointment. Poking Tie Wire: Bend the wire back into a spoon or pencil eraser. If you are unable to, place wax and call for an appointment. Poking Archwire: Cover with wax and call for an appointment. Accidents Involving Teeth: Call your dentist or orthodontist immediately.